Teachers in our classes are all volunteers. Please consider signing up for at least 1 Sunday to volunteer in order to keep our programs going strong. Children at UCE are invited to join in programming that is designed help them explore spirituality in a way that is inspiring and engaging for them. 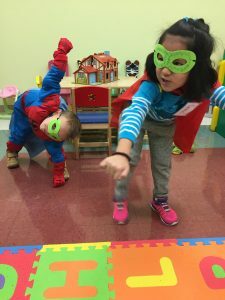 Classes include stories, songs, games, arts and crafts, and age-appropriate discussions that teach children to recognize the importance of community, appreciate diversity and difference, respect the natural world, and develop their own personal ethical values. Stories and lessons draw from a variety of sources. Children learn about Unitarian Universalist principles and traditions, and they also explore stories and lessons from other faith traditions, such as Aboriginal spirituality, Christianity, Judaism, Islam, and Buddhism. Children’s fictional literature is another important source for spiritual and moral discovery. Classes run at the same time as the main worship service on Sunday mornings, 10:30 am to 11:30 am. It’s a good idea to have kids at church by 10:15 am, so that everyone can settle in before things start. If you are new to the program, please see class teachers about filling out a registration form. Children’s classes close with a snack prepared by community volunteers; please make sure that leaders are aware of any food allergies. When the weather permits we sometimes choose to run activities outside at the park across from the church. Teachers will let caregivers know if we are heading outside that day. Please make sure kids come to church with appropriate outdoor clothing in the fall and spring so they are prepared to participate in outdoor lessons.